Continuing on from my observations earlier in the week in which I was pointing out that I tend to cheap out on bike frames. I pulled the trigger on the Sette Serum Pro, which I bought from Price Point. It turned up about 29 hrs after ordering it, at a cost of just over $1,800. To nonbikers and especially spousal units, this is not “cheaping out”. For us normal folks, this is a SCREAMING good deal. Trolling around the usual suspect major manufacturers like Trek, Specialized, Giant, Jamis, Cannondale, etc you will find, first, that many of the hardtail MTB offerings of any decent quality are 29″ wheelers these days. Being the retrogrouch that I am, I had to peer a bit harder to find the 26″ers. Still, it rapidly became clear that the $2,500-$3,500 range was the entry point. Many of these, especially on the lower end, were Al frames. I am not a fan of aluminum for bike frames, all else equal. I find them to be noisy, as a first fault. Second, I was biased during my enthusiastic mountain biking days in the early to mid 90s when boutique framebuilders were sprouting like weeds. I saw many, many fairly expensive mountain bike frames get cracks. This put me off both Al frames and boutique builders…and reinforced the notion that extra cost did not mean extra quality when it comes to bike frames. I do ride a Al Redline cyclocross bike so I’m not totally biased. Some of my best friends are…..ahem. Back to the story, my initial read was that the more obvious bikes in my initial price range were specified with a mixture of SRAM X.7 and X.9 drivetrain parts. Some of them came with Shimano SLX (which seems to be a fair enough replacement for the old Deore LX line, even though I think it started out below LX). I was really looking for a carbon fiber frame though, given the great experience I had with a circa ’95-96 Mongoose IBOC Team SX Carbon frame. To get a carbon frame one, I was seeing things on the upper side of the $2,500-$3,500 range, but still finding bikes specified with the same approximate parts bin. There’s nothing wrong with SRAM, though I haven’t spent serious time with it. From the price points though, it seems that X.9 is slotting in just beneath XT. And, as I said, SLX seems okay and in fact I had been riding SLX cranks for a year or so. The thing is, while I tend to cheap out on frames, I also want the value of the just-below-chi-chi componentry. Off road that pretty much means Shimano XT. At the very least in the derailleurs and shifters. I can manage with lower level hubs and cranks. But the shift-train is kind of important. Especially as I get old, have little time for maintenance and want the bike to work when I have a chance to get out for a ride. Looking at the XT-spec bikes is what gave me sticker-shock conniptions. The notion of Trek or Specialized hardtail MTBs that run over $6,000 is a little daunting. So I was trolling around the internet trying to find something a little more affordable and I ran across the Sette. This is more like it. 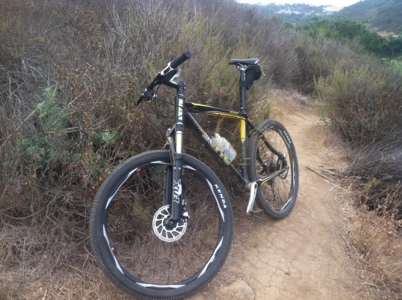 Carbon frame, XT kit (shifters, derailleurs, cranks, wheels)…disc brakes that look to be a decent line (Avid Elixer CR. heck, I wouldn’t have sneered at cable actuated ones). I was previously riding an old Mag21 that hadn’t been touched in many years so the fork selection was going to be better no matter what. The XT is 9-speed, not the current ten speed introduced in 2010 or so. I was uncertain about how dated the components are but figured it was a good place to save some money, even if this stuff is a couple of design years old. It sure as hell was going to be an update on my old bike, even if the XT was from the 2009 design year. Reviews online were a bit hard to come by, you can Google them yourselves. Not hard to find but there aren’t very many of them. Nevertheless, the available reviews all seemed to conclude the bike was “as good as advertised” . One check of the geometry spec for my size frame (19″) and I was pretty much good to go. As I said, it came in a day. First impressions are excellent. The double-box referred to elsewhere is an impressive way to ship. You will definitely need some basic bike mechanical skills, as with any bike you buy in a box. If you can’t break down and reassemble a bike then I suggest you don’t really have much call to be mail ordering. Unless you have a bike buddy who can help, I suppose. This was a straightforward job of installing the seatpost (seat already mounted), stem (bars already mounted) and front wheel. It comes without pedals, the assumption being you’ll have your own clipless pedal preference. I do and am using my old ones. There were only two problems I noted with the preparation. First, the front brake caliper was off and I had to re-adjust it. I am not too familiar with discs so I may have to play with it a bit but I got it in working order pretty quickly. Without referring to any manuals…so it’s pretty damn obvious what to do. Second, the bars were mounted in the stem at a smidge of the wrong rotation. This is an easy fix and almost comes under the personal adjustment clause. Personal adjustment: These are things that you can’t blame on a mail order bike, but that you might possibly have fixed at a local bike store at the time of purchase. The stem is not right for me, I’m going to need a different one. This is totally typical and the one on the Sette is pretty neutral (about a 100 mm, 6 degree rise)…presumably designed to fit the larger number of riders. Second, the seat post may not allow enough set-back as the clamp is directly over the post centerline. At some point this became popular with off-road posts, replacing the traditional look that included the clamp centered behind the post. I’ve had to go with set-back models in the past so again, this is expected. Posts run anywhere from $20 to $120 (and up) and stems go from $20-90. So there’s $100 or so that you might possibly have saved in the bike store purchase as they will occasionally do a size swap. That’s a long ways from the thousands of bucks differential in bike purchase price, don’t you think? The only thing to criticize here is the Kenda small block 8 tires. As I read in one of the available reviews, these are a pretty good road tire. Since tire preference is so individual , I’m giving the Sette Serum Pro a pass on this. Still, you can add another $100-$120 bucks to the cost to get yourself a set of decent skins. Initial verdict is, just as good as advertised. And a screaming good deal. June 28: This post has been edited from the original, mostly for readability and to expand on some things I left too abbreviated in the original version. You are currently reading Sette Serum Pro Review: Part 1 at Sun Dappled Forest.